How to Convert Word Document to PDF File Format? Yesterday, my father asked me to convert word file in PDF format. I thought about the simplest way possible to do this without any software. I came up with an idea to do so. I showed him the simple steps involved in the conversion process. I used trustworthy service. It took only a minute to convert word document to PDF file format. The overall conversion process is very simple! The only thing that you need is a Google account and an active internet connection. 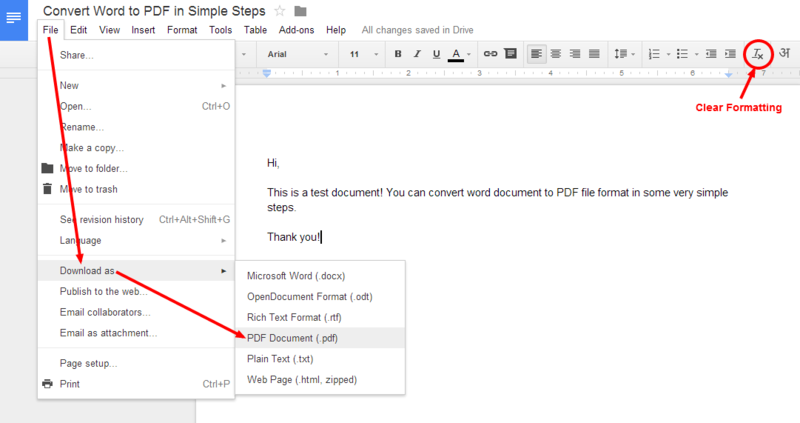 Following are the simple steps to convert word document to PDF file format. If you do not have Gmail or Google Account, you first need to sign up for Google services. Open drive.google.com and login with Google Account username and password. Click on that red button “CREATE”. Open the word file that you want to convert in PDF format. Press ctrl + a to select all the text in that word file. Press ctrl + c to copy that text. Open newly created document on Google Drive. Press ctrl + v to paste the copied text on newly created document. Document will automatically be get saved. You might see the text format and alignment of the document has been changed. There are tools at the top of the editor to correct the format and alignment. There is also the option to “Clear formatting”. Make sure your document is now in the proper format. Click on “File” from the menu bar. Move your mouse over “Download as”. The output PDF file will get downloaded on your computer. There are total 15 steps involved in this process of word to PDF document conversion, but each step will take only few seconds. Text formatting part might take some more time, but that depends on your formatting requirement. The best part of this process is that you do not need any external software. You do not need to upload your document to some unknown online service for online conversion. Signing up to a new service is not required. But, you do need an active internet connection. This can be the only disadvantage of this conversion process. But you can use this process for the quick conversion between word to PDF , as we rarely experience internet connection downtime in this age of internet. Previous Post How to Make Free Calls from Mobile?